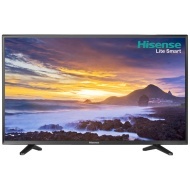 alaTest has collected and analyzed 31 reviews of Hisense 55K220 Series. The average rating for this product is 4.4/5, compared to an average rating of 4.6/5 for other products in the same category for all reviews. Reviewers really like the sound and price. The size and image quality are also appreciated. We analyzed user and expert ratings, product age and more factors. Compared to other products in the same category the Hisense 55K220 Series is awarded an overall alaScore™ of 89/100 = Very good quality. Good picture quality, Wireless with Miracast is very handy. Amazing piece of equipment. Intuitive, packed full of features and looks amazing. I would have paid £600 at least for this. Save yourself a few hundred quid and get this one. For the money it costs, it's brilliant. Straightforward to setup and looks great. Design is smart although the stand design is quite wide, luckily it just fit on my TV unit!